Our product range includes a wide range of isolation transformer, 25 kva isolation transformer and three phase isolation transformer. 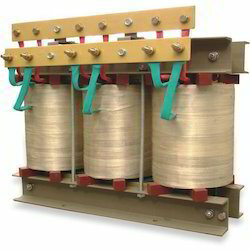 Any transformer, single or three phase in which primary and secondary are separately wound (Double wound) is an Isolation transformer as primary and secondary are internally isolated from each other. The power transfer, at rated frequency, is by transformer action through mutual inductance. The modern machines and system need a truly isolated clean power in which any electrical disturbance in the primary side is effectively not passed on to secondary side. 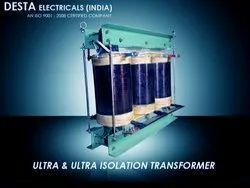 Therefore an Isolation / Ultra Isolation transformer ensures total electrical and electro static isolation with most effective screening of spikes, surge and transients. Further, it gives a true isolated local neutral and dedicated earth which is essential for modern machines. It provides noise or interference free power and prevents transfer, RF and HF disturbances with extensive isolation between primary and secondary. The isolation level with stand HV break down strength of 2.5KV and give DC galvanic isolation of more than 1000M Ohms. There is common problem at same sites that power neutral is missing / weak or not available. At this site A/C does not start as voltage does not develop between phase and weak or missing neutral. 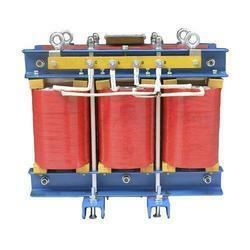 These Three phases Isolation transformer are designed to get rid of these problems. In the Isolation transformer a new neutral is generated, which is healthy, perfect and has no connection with the neutral of electricity supply and hence unbalancing does not occur resulting in the A/C compressor and machine working perfectly fine.